During the winter heating season, homeowners with uncovered central air conditioning vents spend more that $200 in unnecessary heating costs that could be saved with A-C DraftShields central AC vent covers. They are designed to prevent heat loss, conserve energy, and save money by covering central air-conditioning vents, and preventing icy drafts from entering your room thru open vents. Closing the louvers in your grilles will not stop airflow and associated heat loss because it is not a total seal. A-C DraftShields central air vent covers are available for all standard-sized central air conditioning vents, and can be mounted on walls or ceilings in seconds without any tools. Hot air produced by heating systems in fall/winter lose thermal values of 30% or more through the central air duct system. 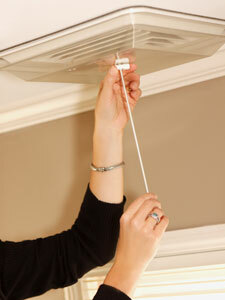 Heated air rises, and is drawn through unsealed central air conditioning vents into ductwork in the cold attic. The air is re-introduced as icy drafts through lower vents. A 15 to 20 degree difference often exists between upper heated room air and lower register re-cycled cold air, emitted from lower air ducts. A-C DraftShields central air vent covers will block cold drafts; prevent moisture from entering your AC system; inhibit the growth of mold and mildew; and keep your home comfortably warm. Using A-C DraftShields central air vent covers to insulate against heat loss will result in hundreds of $$$ in energy savings each year. A-C DraftShields Covers also are available to insulate standard thru-the-wall air conditioners from inside your home, and install in minutes with only simple tools. A-C DraftShields Covers are available right now! Visit our Online Store and place your order. You are just one click away from a warm, cozy winter. Tell your friends and family, and share the warmth of a winter without drafts. Order today!